Limits to Growth – of What? Average national income is a notoriously imperfect measure of the average person’s well-being. The 2010 BP oil spill in the Gulf of Mexico – with clean-up and damage costs of $90 billion – added about $300 to the average American’s “income.” But it added nothing to our well-being. The world’s most expensive prison system, costing almost $40 billion per year, adds another $125 per person. This doesn’t make us better-off than people living in countries that don’t incarcerate one in every 100 adults. Of course, national income includes many good things, too. Growing food and building homes add to national income. So does public spending on education and health care. Unlike oil spills and jails, these really do add to our well-being. Along with good stuff and bad stuff, national income includes a third category of stuff that’s just useless – goods and services that neither add to our well-being nor subtract from it, but still get counted in the income pie. A prime example is what the economist Thorstein Veblen called “conspicuous consumption” – items consumed not for their intrinsic worth, but simply to impress other people and jockey for a higher rung on society’s pecking order. These goods and services have zero net effect on national well-being, since for every person who climbs a rung, someone else slips one. Of course, not all bad or useless things are counted as national income. But neither are all good things. Unpaid work caring for children, the elderly and the disabled doesn’t count. Clean air, clean water and climate stability don’t count. Open-source information and culture don’t count. 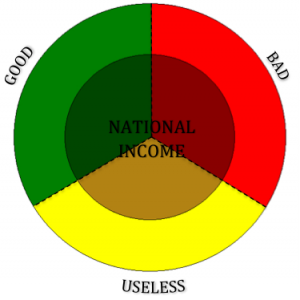 The national income pie is an odd subset of the good, the bad, and the useless. All three slices get lumped together when economists tell us that average income in the United States today is roughly $42,000 per person. Researchers in the emerging field of happiness studies have devised other ways to measure well-being. They find that beyond the level of income that is needed to satisfy basic wants, such as food and shelter, there is little or no correlation between a country’s average income and the happiness of average person. Past some threshold, increases in the good and bad appear to cancel each other out, and the useless slice of the income pie can get pretty fat. Since national income isn’t the same as well-being, growth in national income isn’t the same as improvement in well-being. All too often, this crucial distinction gets lost in acrimonious debates about the relationship between the economy and the environment. Forty years ago, a report called The Limits to Growth drew attention to the indisputable fact that our planet does not have an infinite capacity to serve as a source for raw materials and a sink for waste disposal. In choosing to call this idea the “limits to growth,” the authors fell into a rhetorical trap that has haunted environmentalism ever since. The problem is that most people believe that growth is good. When they think about the national income pie, they think about the good slice, unlike environmentalists who think about the bad slice. Because they’re really talking about different things, proponents and opponents of growth often talk right past each other. And when they assume that the good and bad are inseparable, both sides buy into the myth that there is an inexorable tradeoff between economic well-being and environmental quality. If the good and the bad must go together, they must grow together. The result: growth wins, and environmentalists play damage control. To find a way out of this impasse, we need better measures of economic well-being, better public policies, and better language. A growing number of economists recognize the need to develop new measures of well-being that count the good as positive, subtract the bad as negative, and ignore the useless. In 2009, the international Commission on the Measurement of Economic Performance and Social Progress, chaired by Joseph Stiglitz, Amartya Sen and Jean-Paul Fitoussi, produced a powerful and wide-ranging critique of the conventional measure of national income. In the U.S., dozens of state-level initiatives are now experimenting with different ways to measure well-being. In the policy arena, we need to both advance human well-being and protect the environment on which it ultimately rests. This requires not only sound regulations, but also true-cost prices to orient investment and consumption decisions to the full range of costs and benefits. In climate policy, for example, although regulations such as those recently announced by President Obama can help promote the clean energy transition, in the absence of a price on carbon emissions there will always be strong incentives to burn cheap fossil fuels. Last but not least, we need better language. We need to move beyond the stale “pro-growth” versus “anti-growth” rhetoric of the past. It’s time to raise a new banner: Grow the good and shrink the bad. James K. Boyce teaches economics at the University of Massachusetts, Amherst, and is co-founder of Econ4: Economics for People, the Planet, and the Future. His most recent book is Economics, the Environment and Our Common Wealth. The “trophic theory” of money combines concepts from ecology and physics to explain how the economy grows as a whole, including the service and information sectors. This and many of the other points so well made here by Boyce are described in detail in a new book Supply Shock and at http://www.steadystate.org. I agree with Jim. I have visited the slums of India among people with negligable income and some with no real housing, but they and their children seemed happier than many in the US having many material possessions. I have relatives in Sweden having modest salaries but taxes much higher than ours. However, they are provided with many services by their government and feel secure in needs for medical and elderly care and in education of their children. While their net income is less than many in the US, I find them far happier. I believe that so long as one is provided the important needs of life, either through personal earnings or from the government, one can be happy. Income in excess of this often leads to concerns and activities that are a “drain” on a productive life. Bigger is not necessarily better! There are a few oddities here. The statement that “for every person who climbs a rung, someone else slips one” is not supported by any sort of reasoning, nor is the assumption that “conspicuous consumption” has no net effect on national well being. .The people who earn a living producing those conspicuous consumption goods would beg to differ, particularly since, given the price of goods manufactured in America, those goods make up a disproportionate share of US domestic production. There’s nothing wrong with looking at growth as one significant component of national economic well-being. Problems emerge when we start viewing is as the only significant component of national well being. The overemphasis on growth isn’t only down to politicians or economists, either: part of it is due to news media and a news audience that wants complex concepts distilled down to simple numbers. And, since I didn’t read the comments before posting mine, I will say this. I have lived over 30 years in the developing world. I’ve spent extended periods of time among poor people in both rural and urban settings. There are few things that make me want to retch quite so consistently as westerners who wander through, take a casual look, and walk away talking about how happy everybody seems to be. Some people need to take some time, learn the language, and see how people actually live in these places before shooting their mouths about who “seems happier”. Visiting tells you exactly nothing. I beg to differ that building homes adds to our collective well-being. The rate of growth of humanity converting forest and farm land to “ruderal” landscapes far outpaces the rate of growth of our population (which is a problem in itself). Urban sprawl further entrenches the automobile-compulsive lifestyle, yielding evermore pavement, evermore combustion of fossil fuels and an ever increasing fragmentation of the natural landscape, which squeezes all species other than human commensals into an ever shrinking survival space. And much of this home building clearly falls into your “useless” category of conspicuous consumption, as it consists of 2nd and 3rd homes of the wealthy. Living in a home should require the same sustainability test of everything else we do–reduce, reuse, recycle. Economics aside, building a new structure of new materials on undeveloped land, perhaps requiring new infrastructure does not add to civilization’s well-being. 19 firefighters just died fighting a blaze that quite possibly put them in harm’s way trying to save second homes in forested areas that people should not have built homes in. For an R1 economist, you really haven’t thought this through very well at all.